PETERBOROUGH, Ont. 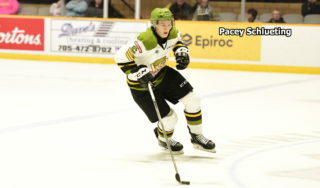 — Kyle Jackson’s first two Ontario Hockey League goals helped propel the North Bay Battalion to a 7-2 rout of the Peterborough Petes on Saturday night. Justin Brazeau and Nick King each had one goal and two assists, Matthew Struthers and Brad Chenier contributed one goal and one assist apiece and Harrison Caines also scored for North Bay, which has a won-lost-extended record of 21-18-3 for 45 points, third in the Central Division. Goaltender Christian Propp faced 52 shots, the most the Battalion has given up this season, as the Troops opened a two-game road trip. 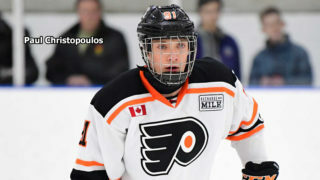 Nick Robertson had one goal and one assist and Cameron Butler also scored for Peterborough, 22-17-2 for 46 points, third in the East Division. Goaltender Hunter Jones made 22 saves before a crowd of 3,772. It was the teams’ third of four meetings. The Petes won the first two by 4-1 scores, at North Bay on Oct. 8 and at home Nov. 29. Peterborough had a different look from the last time the teams met. 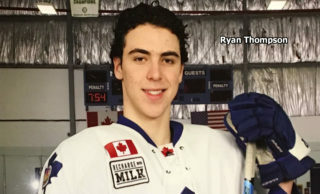 In deadline trades Thursday, the Petes added Michael Little from the Mississauga Steelheads while dealing fellow left winger Nick Isaacson and defenceman Cameron Supryka to Mississauga and the Hamilton Bulldogs respectively. 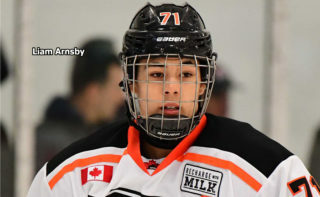 Peterborough’s biggest move since its last game against North Bay was adding rearguard Ryan Merkley from the Guelph Storm on Dec. 14 for left winger Pavel Gogolev and five OHL Priority Selection picks, four of them conditional. Brazeau opened the scoring at 14:13 of the first period. King saved the puck at the blue line and hoisted it to Brazeau alone behind the defence, and he spun to steer the disc past Jones. Brazeau, with 40 goals and 34 assists for 74 points in 42 games, leads the OHL scoring race by a point over Tye Felhaber of the Ottawa 67’s. Brazeau, who eclipsed his career-high goals total of a year ago, is chasing Mike Amadio’s franchise record of 50 set in 2015-16. Robertson, who scored in a fifth straight game, replied on the power play at 6:13 of the second period. Semyon Der-Arguchintsev’s shot glanced off defender Theo Calvas and the puck slid to the right-wing circle, where Robertson whipped it past Propp. Struthers restored the Battalion’s lead with a man-advantage goal at 10:22, collecting a loose puck behind the net and tucking it inside the right post. Chenier and King earned assists on Struthers’s 20th goal. Jackson scored what proved to be the winner at 16:41 on a sparkling individual effort. He took the puck at his own blue line, escaped Robertson and drove between Christopher Paquette and Austin Osmanski on the way to the net, where he beat Jones high to the stick side. The Petes outshot the Battalion 20-9 in the frame. Propp’s biggest save came with Peterborough on an early power play when he stretched to deny Paquette with the left pad. Jones, who snared a Brandon Coe shot in close with the Troops shorthanded in the third minute, foiled Patrick Brown in the 13th after he seized a deep turnover. Caines was credited with his fourth goal at 1:54 of the third period when his attempted pass across the goalmouth to Mitchell Russell deflected off defender Matt McNamara. 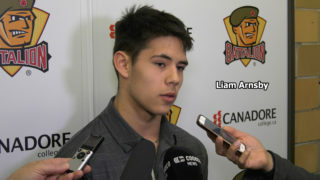 Jackson, who was called up earlier in the week from the junior A Ottawa Jr. Senators, struck again at 3:46, converting a loose puck in the crease. Assists went to Brazeau and Struthers. Chenier made it 6-1 on the power play at 11:03, beating Jones low to the stick side from deep in the right circle. Brazeau and David Maier assisted on Chenier’s 22nd goal. Butler struck on the power play at 15:54 before King finished the scoring 16 seconds later on a shot from the blue line. Zack Malik and Mason Primeau assisted on defenceman King’s eighth goal. Malik’s point was his first since being acquired last Tuesday from the Sudbury Wolves. The Battalion completes the road trip in facing the Kingston Frontenacs at 6 p.m. Sunday. The game can be seen live in North Bay on YourTV Channels 12 and 700 and heard on Country 600 CKAT. BATTALION BULLETS: In 242 games, Brazeau has 107 goals and 92 assists for 199 points, seventh in franchise history, one point ahead of Brett McKenzie, the previous leader among Battalion players who have skated only since the 2013 relocation to North Bay … Chenier has a nine-game points streak in which he has eight goals and eight assists for 16 points … King has a six-game points streak during which he has four goals and six assists for 10 points … The Battalion went 2-for-4 on the power play. Peterborough was 2-for-8 … Opening lines featured Struthers centring left winger Caines and right winger Brazeau, Primeau pivoting left winger Chenier and right winger Coe and Luke Burghardt centring left winger Jackson and Russell on right wing. 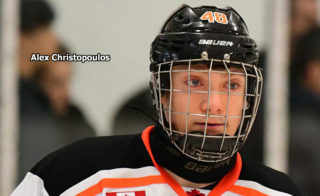 Centre Luke Moncada and Brown on right wing had various linemates … Each team dressed 19, one below the limit, as the Troops were without Travis Mailhot, Simon Rose, Daniel Walker, Kurtis Evans and Cameron Peters … Walker started serving a two-game suspension. He received a crosschecking minor and a misconduct and game misconduct for abuse of an official in a 4-3 overtime win Thursday night over the visiting Steelheads … Russell played his 100th OHL game, his eighth with North Bay since a Dec. 28 trade from the Owen Sound Attack … Maier turned 19 on Saturday, as did the Petes’ Declan Chisholm.